As we look back on our own lives and the lives of our grandparents, it is easy to see a snapshot of 60 to 100 years. So many new developments have been made during this timeframe that have a direct and indirect influence on all of us. We quickly think of medicine, transportation and communication. These arenas have been changed dramatically. Can you imagine where we would be without penicillin? Air travel is common place to us now. To our elder grandparents, it wasn’t even an idea. And communication – the cell phone is a way of life today. So what about the construction industry? Count on your fingers (you probably don’t need your toes) the real improvements to the industry. Yes, we have lasers that help us with grades and elevations. Much better than the water hose with glass tubes at the ends. This has been a real boost for the site work segment, for cuts/fills and grades. But, for the most part, the work of the construction industry has been the same for generations. People have done the hard and taxing work. Dad, Grandpa and their predecessors worked day in and out, building our country and the world. We have a tremendous opportunity today to use the advancements of technology and to find new advancements, to bring the construction industry into the 21st century. The backs of manpower and womanpower should not be the primary tool of the industry. We have, I believe, an obligation to the people of the industry to make their lives better and improve the efficiencies of the construction process. In short, the construction industry should advance, just like its counterparts in medicine, transportation and communication. Men have historically lifted the load, carried it to the needed location and placed it in its desired location. Cranes and other lifting devices have aided the processes that were done with pulleys and ropes. We should marvel at the Roman and Greek structures, how they were constructed with the available means and methods – a tremendous achievement. Time and economics are now increasing the need for new means and methods. The industry does not have the luxury of endless durations, and the work force is slowly diminishing as experienced tradesmen age. The workforce needs to be protected from injury and age-related physical developments. One cannot be satisfied to continue the course. The career positions should be both challenging and rewarding, and attractive to new young talent. Universities, technical schools and organized labor are the primary sources and leaders for educating the workforce of the future. A great opportunity exists in the construction industry, largely due to the continuous need to build. Training and education are at the heart of the future. 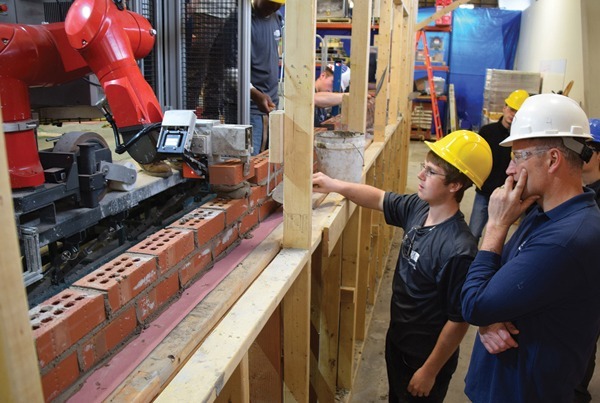 As other industries have implemented new technology, including robotics, they have gone through periods of re-training and increased education. That has allowed those industries to create high-demand technical jobs and attract a stronger work force. New studies have shown that implementing robotics and new technology helps companies to be more efficient and, in many cases, doesn’t reduce the number of jobs but can actually increase that number. Re-training and education are a big part of that job growth. We can’t continue to think short term and expect our industry to grow and succeed. We must think about attracting more young people and giving them new, engaging tools to make their job more appealing and interesting. Investing in new technology, equipment and training is an investment in your people and the future of the industry. Nathan Podkaminer is the co-founder of Construction Robotics. He is a registered architect with more than 40 years of experience managing multimillion-dollar construction projects and has brought many new construction concepts to the region. He is a senior executive with the Hueber-Breuer Construction Co. in Syracuse, N.Y., and was critical in the growth of the company from four employees when he started in 1975 to more than 45 today.